FREE Prospecting for one week or all summer: *How it works: 1. Sign the documents; 2. Go prospecting; 3. Bring us samples; 4. Decide if you want to prospect longer or do larger mining. It’s that simple. * *You will need to give us the signed documents and then show up with your small mining equipment (6” dredge or smaller) and supplies and go to the claims and start prospecting for one week. At the end of one week you must bring us the bagged and labeled samples and required Miners Logs, royalty, coordinates and photos of the testing sites. If you have complied with the terms of the agreement we will, most likely, allow prospecting all summer long one week at a time. Any time you decide that you would like to mine a site with small mining equipment you will need our approval. When you decide that you would like to mine the site with larger motorized equipment we will require a new agreement which will allow you to do so after you have received the permits to mine. If you would like us to assist you with the permitting process we will. 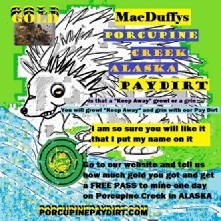 ADVENTURES: Daily, Weekly or All Summer Gold Adventures on Porcupine Creek. You may fly, drive, bike, hike, RV, truck or bus to Duffy’s on the Main Highway in Alaska - we have a runway. You may hike in or bring an ATV (coming soon: we will take you back the 5 miles to our claims by ATV or - rent an ATV - Gold Panning at Duffy’s - Off Road Tours - Airstrip with flightseeing, hunting or fishing Adventures - RV Park - Cabins - Auto Service - Towing - Café - Fuel - a Store & More) – We are shown on Road Maps and all Aeronautical Charts - Gold Adventures: June thru September. THE PROSPECTORS DREAM: NEW: YOU CAN PROSPECT OUR CLAIMS 1 WEEK OR ALL SUMMER FREE! 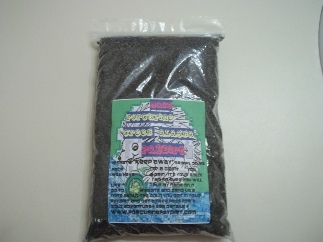 READ “PROSPECTORS DREAM” ON THE “FREE ADVENTURES” PAGE - YOU WILL NEED YOUR EQUIPMENT AND AN ATV. We are on the highway and have a runway: YOU MAY FLY, DRIVE, HIKE OR BIKE, TRUCK, RV OR BUS TO OUR TRUE ALASKAN ADVENTURE! YOU CAN PROSPECT OUR CLAIMS 1 WEEK OR ALL SUMMER FREE.